A recent exhibition of graduates’ work from three casual workshops held by the Victorian College of the Arts. The three workshops run across a full year, covering drawing, painting and sculpture disciplines. The casual workshops have no entry prerequisites, trying to appeal to the widest possible audience. This is a commendable philosophy that establishes a great diversity in students, though it also has the inevitable result of a wide range in quality. Most of the works, we have to say, were not memorable. Trevor Liddell’s drawings and Angela Pye’s sculptural installation were exceptions – both real gems in the rough. 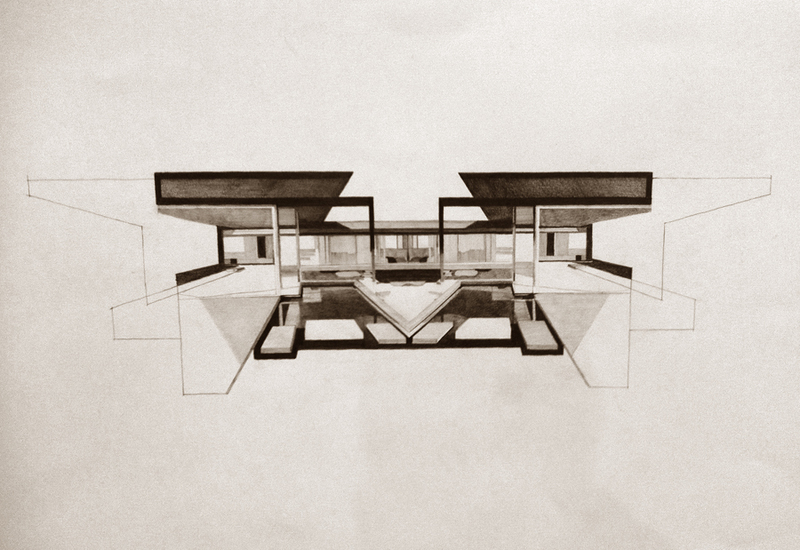 Liddell’s drawings, Neutra Series (above), are re-workings of photos of Richard Neutra’s modernist architecture. He successfully combines both cerebral and craft-driven techniques into vivid renderings of the great architect’s famous imagery. Through mirroring, selective deletion and exaggerated perspective, Liddell filters the original photos through a lens that exposes the core geometries of modernist form-making. The fine line-work and warm tones of the drawings reveal a meditative process of making that further sharpen the works’ inherent beauty. The resultant, semi-abstract images are architectural, graphical and iconic. 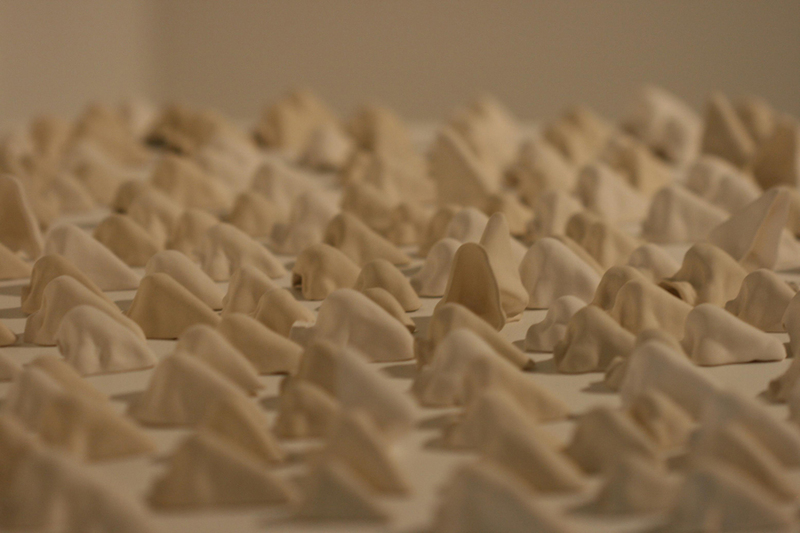 Angela Pye’s sculpture, In Between, is a field of 200 slip-cast porcelain noses. Taken from the noses of 30 friends and family (including Pye’s own), both the finished work and the process of making them are experiments in proximity. Pye states that she is “intrigued by the distance between noses… as one of the protruding parts of the body and a defining feature as one gets closer to another.” Viewing the work, the first thought that comes to mind is how awkward and intimate its production must have been, a sentiment echoed by Pye: “It was fascinating to feel the initial awkwardness of being so close to someone and see this slowly dissolve.” In Between is a compelling work in equal parts empathetic and humorous. Both Liddell and Pye demonstrate the consideration, technical skill and immaculate attention to detail typically found amongst experienced artists. That both have other “day” jobs and neither work full time as artists makes these attributes even more remarkable. We congratulate them both on their engaging works, thank the VCA for providing them the opportunity to practice and exhibit, and eagerly anticipate future contributions to the wider artistic discourse. Safe enough or too safe?